The Centre Georges Pompidou is a striking building of industrial girders and tube walkways, located in the 4th Arrondissement of Paris, close to the areas of Les Halles and Le Marais. Housing the Musée Nationale d’Arte Moderne, a huge library and a research centre, this imposing, postmodernist structure stands out against Paris’ other, more classical, architecture. 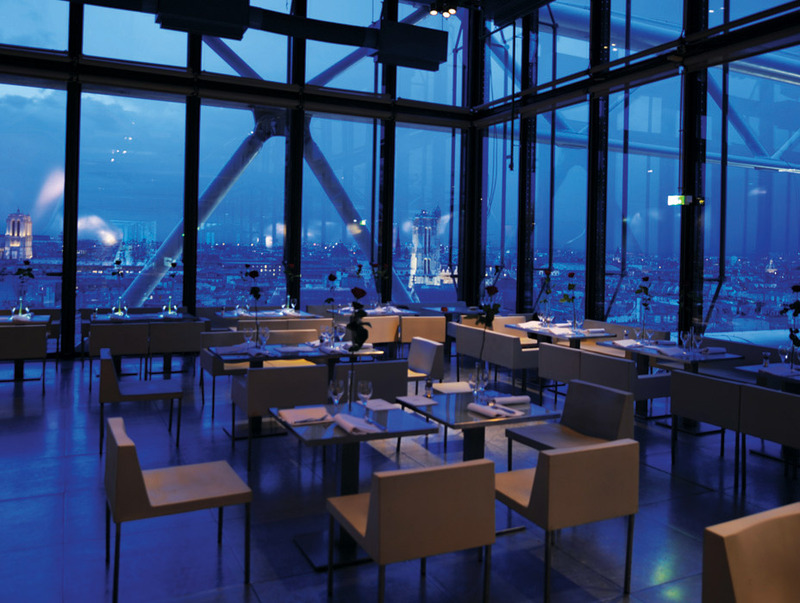 At the top sits Restaurant Georges, encased in glass and steel, the interior designed in a similarly avant-garde style by Dominique Jakob and Brendan McFarlane. 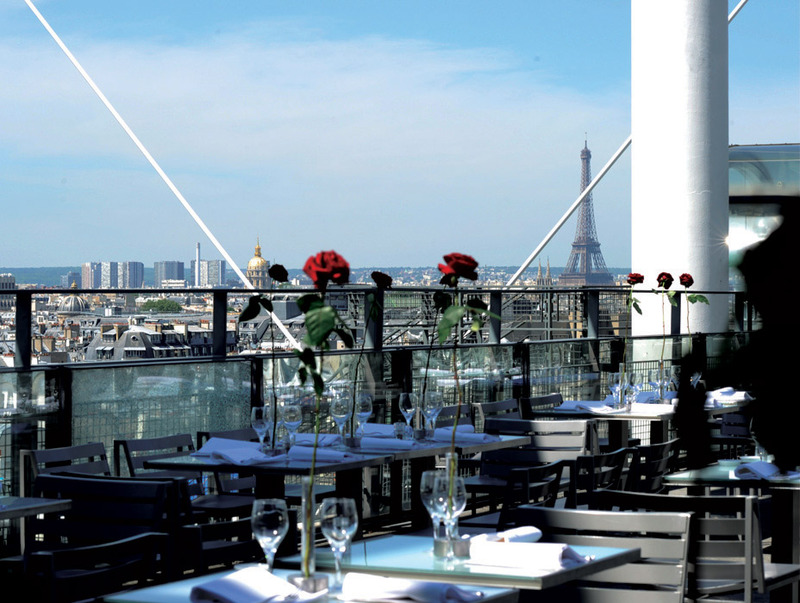 With the sun setting over an incredible panoramic view of Paris, the roof terrace is the real selling point of the restaurant and it was there that Charlotte and I sat to dine. The clientele were glamorous and trendy, all up-dos and red lipstick, skinny ties and designer stubble. However, none of the diners seemed as glamorous as the staff, who I can only assume are all out of work models in the same way that they say LA waiting staff are out of work actors. The restaurant manager surveyed his living lookbook with a haughty air and directed us to a seat close to the vertiginous railing. We ordered champagne at once and perused the paper menu, printed at curious angles and (backwards) with the words: Georges Abstraction Surface Air. I am not an expert in modern art and I found myself glancing around, wondering if I had stepped into some sort of interactive installation. An installation with pigeons. Our waiter, Mrouan, dispelled any of these ideas with his friendly and polite service, so we asked for his recommendations in both menu choices and wines. This led me to choose the tartare de bar épicé for the first course, while Charlotte – who was not to be influenced in her choice by anyone – went for the ‘escargots extraordinaire’. These snails were as big as any I have seen on a plate and simply oozing with garlic butter. As well as coming with all the appropriate specialised snail-eating devices, they had been presented in a bowl of salt to keep them upright and tiny toast points had been provided to mop up the divinely rich sauce. My first course was fresh and light, the meaty sea bass was able to stand the chilli kick and strong flavour of spring onion. For the main course, Charlotte chose the mandarina crispy duck and I decided to be adventurous and try the mysteriously named ‘le tigre qui pleure’ (the crying tiger). The duck consisted of both a breast and leg portion of substantial size, with an excellent soy and ginger sauce and both mains came with rice as a side dish. Le tigre turned out to be steak, cooked to order and sliced, with similarly Asian flavours, although the unmistakable taste of nam pla was a very strong feature. The steak was medium rare, as requested, and the saltiness of the sauce went wonderfully with the juicy meat. We decided to finish with Mrouan’s recommendations again; my dessert was my first Parisian macaron and was the size of my fist. Had I known how many we would consume on our luxury macaron tour the following day, I would perhaps have made a different choice, but it was the perfect texture and full of fresh strawberries and pale creamy filling. Charlotte ordered the petit tarte citron and found the pastry to be crisp and thin, as only an expert pâtissier can create. We accompanied the final course with a lovely, melony Sauterne. 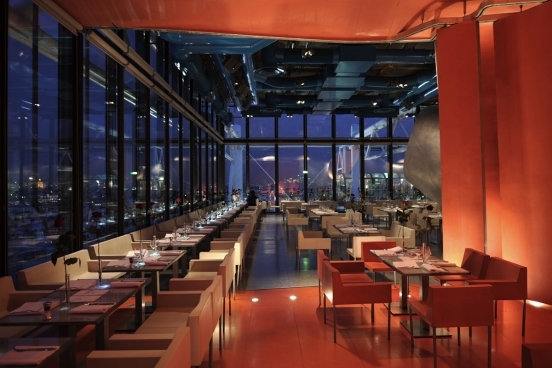 At first glance, one suspects that Restaurant Georges depends on its chic design and the mind-blowing Parisian skyline to draw in the customers and, it is true, perhaps there are better places to dine if you feel that these features would add nothing to your dining experience. 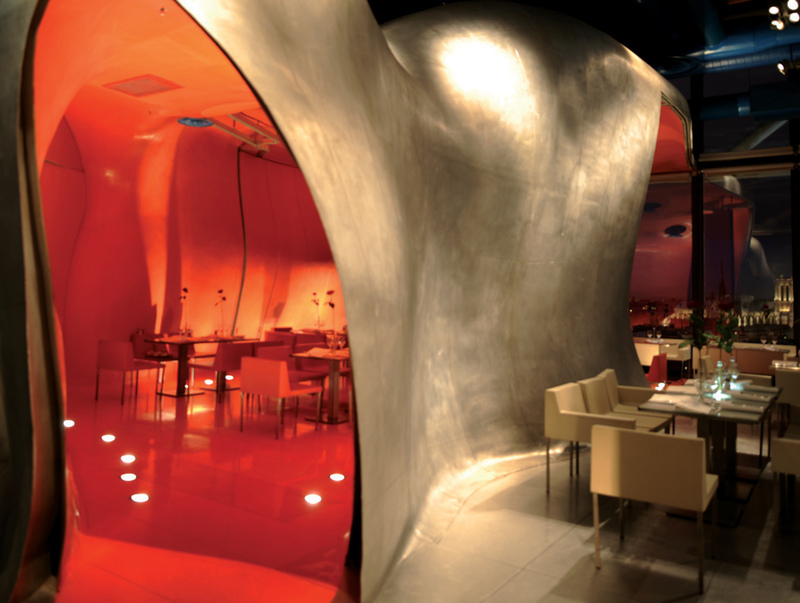 Restaurant Georges is one of several Thierry Costes restaurants in Paris, another being Caffe Burlot, and there is a very distinctive feel to them with heavy emphasis on design. However, Charlotte and I were very impressed, given the spectacular and unique location; the food was very good and, if you happen to like breathtaking views, there is nowhere in Paris like it.